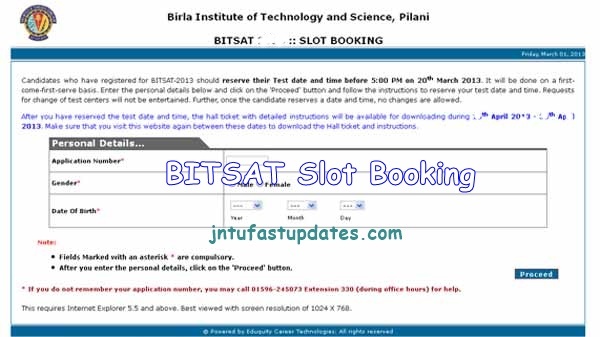 BITSAT Slot Booking 2019 : Bits Pilani Entrance Test 2019 Admissions for B.Tech Exam Slot Booking Commence From april 5th. Students Should Book Your Bitsat Exam Slot time and Date, Location Preference at bitsat official website as per procedure which is mentioned below. Birla Institute of Technology Pilani has accepted the applications from aspirants seeking admission in B.Tech courses. The application process has been successfully completed. Now the BITS Admission Test (BITSAT) Slot booking process is going to be started on from april 5th. Aspirants who are going to attempt the entrance test can book the slot Till last date 8th April,2019. Aspirants applied for the examination can book the slot (timing) for the examination, which is going to be held on May. Aspirants can book the preferable college from the list of colleges announced by the BITS Pilani. The educational organization allows the aspirants to book the slots in first come first serve basis. The university to release the BITSAT Admit Cards 2019 from 12th April. Candidates who book the slot can download the hall ticket by visiting the BITS Pilani official website and carry the admit cards to appear for the test. Candidates must have to note that permission to appear for the exam will be denied if they do not carry the admit card/hall ticket. BITSAT Slot booking can be done through first come first serve basis. Slot booking is the essential and easy task which can be done within 2 minutes. The slots will be organized by the exam conducting organizations. Students can only download hall tickets only after the slot booking. How to Book BITSAT 2019 slot Online & Select Test Centers? Candidates can follow the steps given below to book the slot for BITSAT examination. Initially, visit the BITSAT Official website www.bitsadmission.com and log in with the page using the id, password. To Book, the slot candidates need to enter the required details such as BITSAT Application number, email-id, date of birth, gender etc information to book the slot. In the next step, candidates can select the examination center. The list of available options will be displayed by the BITS website soon after the log-in. Among the options, students can select any of the options according to their choice from the drop-down menu. If any of the selected examination centers were already filled, then the applicants have to select the new examination center. Candidates can choose any of the examination centers and can lock it. Once the examination center is booked, it is not possible to change again. After booking an exam center, the candidate has to next book a test date. The dates and slots will be listed on the same page, candidates can select one date from the displayed options. This is the last step in the booking process. Select one slot and tap the “Confirm” button to finalize the slot. After booking the slots, the confirmation will be sent to the registered mail-id. Check the details and take a printout if needed for further verification. Students who have successfully booked the slot can download BITSAT Hall ticket from 12th April 2019. The hall ticket contains the following information.